Columbus, OH — Gregory V. Harmon passed on Jan. 11, 2019 in New Port Richey, Fla. as a result of injuries sustained after being hit by a vehicle. He was 47. Harmon, who was born May 23, 1971 in Akron, Ohio, was a lifetime member of the USTA and an accomplished driver, trainer, owner and passionate fan of harness racing. A third-generation horseman, Harmon was the son of long-time horseman and racing official Donald L. Harmon and grandson of late driver and trainer William Ingham. Third-generation horseman Greg Harmon passed in January at age 47. 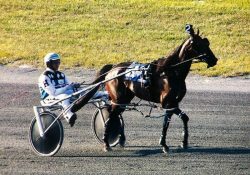 Aside from harness racing, Harmon’s other passion was in the automotive industry, where he had a special gift that allowed him to showcase his extraordinary talents and also afford him the opportunity to do the things he loved so much — meeting new people, traveling, and helping others accomplish their goals. He started his automotive career working for the late Jeff Polichena and later worked for Fred Hertrich’s family of automobile dealerships after moving to Delaware to be with his family. Harmon’s infectious smile, generosity, and fun-loving personality will be forever missed by all that had the opportunity to cross paths with him during his lifetime. The Harmon family expresses their thanks for the letters of condolence, thoughtful acts of kindness, and overwhelming support during this difficult time. A celebration of life will be held at Faith Life Ministries, 418 Rosedale Lane, Dover, Del. on Saturday (Feb. 2) from 1-3 p.m. followed by a gathering at Fraizer’s (formerly known as The Lobby House) in Dover, Del. All are welcome to attend.